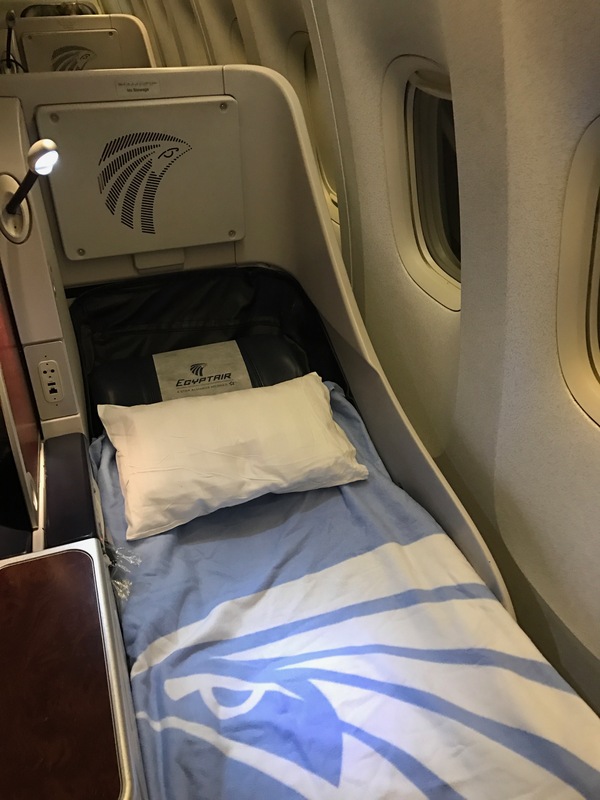 Home » Travel » A Fantastic Experience on EgyptAir! A Fantastic Experience on EgyptAir! Let’s face it: mention EgyptAir and most instinctively grimace. The carrier does not serve alcohol, does not have cutting-edge seats, and boasts a poor safety reputation. Truthfully, those were my preconceptions too going into my flight from London to Cairo. But in what turned out to be an utter surprise, not only did I find EgyptAir acceptable, I loved it. A lot. Not only was the business class seat more than adequate, but the food and service were fantastic. A full review of EgyptAir’s 777-300 business class is coming, but here’s a preview like my Air Zealand flight yesterday. Avoid the middle seats unless traveling in a group of three, but I was very comfortable in my window seat. Bedding is not luxurious, but the blanket was soft. This was an amazing meal for a 4.5 hour flight, though you will receive a similar main meal if you fly the New York to Cairo route. My full report will reveal just how great they were, but this was indeed the surprise of surprises. I cannot help but to strongly recommend EgyptAir after this flight, a very underestimated carrier. Odd; alcohol isn’t illegal in Egypt, and with a significant Christian minority, you’d think the airline wouldn’t be dry. While the meal looks great, I find it disappointing that there are no Egyptian dishes on offer, or at least Mediterranean. One of the things I really look forward to on “exotic” airlines are locally flavored meals.